After Jumping Over 15%, is Cisco Still Undervalued? 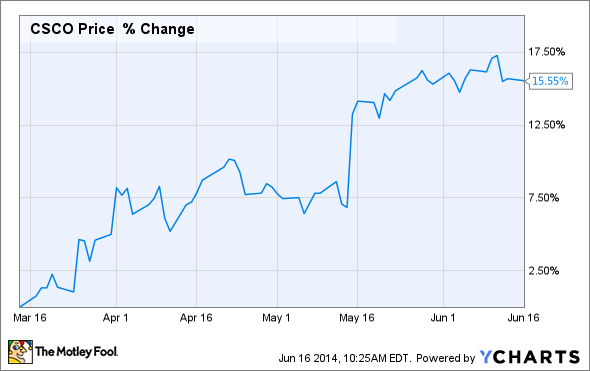 Dow Jones Industrial Average component Cisco has had a solid few months in the market. Is that run going to continue for the long term? The Dow Jones Industrial Average (DJINDICES:^DJI) was down 15 points at 1 p.m. EDT Monday as U.S. factory output was reported to have rebounded in May after a disappointing April. Shares of Dow component and networking technology manufacturer Cisco (NASDAQ:CSCO) have also rebounded to nearly $25, a 15.5% jump over the past three months. Year to date the stock is up 10%. After such a strong run in the second quarter, the question to ask is whether Cisco still undervalued. To assess Cisco's value, today I am going to use two metrics described by professional value investor Joel Greenblatt. In his book, The Little Book That Beats the Market, Greenblatt lays out a system to find undervalued stocks using what he calls earnings yield and return on capital. The calculation for earnings yield is relatively straightforward. First you calculate the company's EBIT, a proxy figure for operating profit. EBIT stands for "earnings before interest and taxes." Once you've calculated EBIT, divide that number into the company's enterprise value, or EV. There is no reason to overcomplicate enterprise value; for the purpose of this exercise EV can simply be the stock's total market cap, plus its debt, minus cash. This earnings yield calculation is similar to a more commonly cited metric, return on assets, except in this case cash is excluded. This formula tells investors how efficiently and effectively the company is turning its assets into profit; by including market cap, it incorporates the company's current price. Because this cash flow number is a quarterly result, we can multiply by four to approximate an annualized earnings yield. Based on that, Cisco has a return on capital of 8%. Simply multiplying by four is not the most accurate way of annualizing quarterly data by a long shot, but for the purpose of this exercise it is good enough to answer our questions. We then calculate return on capital. Greenblatt defines this as the company's EBIT divided by the sum of its net fixed assets and working capital. Net fixed assets are assets such as property, buildings, and/or equipment that cannot be quickly converted to cash. Working capital is the difference between a company's current assets (such as inventory, cash, and accounts receivables) and its current liabilities (such as short-term debt and accounts payable). Again, for simplicity's sake, we'll just take the company's total assets and subtract current liabilities in lieu of dealing with net fixed assets and working capital. This approximation is close enough and helps us avoid the pains of some of the more complex balance sheets out there in the investing world. Here's the calculation for Cisco. As before, we can multiply by four to approximate Cisco's annualized return on capital of 13.6%. Greenblatt says to rate these two calculations by percentage against other companies on the stock market. Companies with above-average earnings yield and return on capital have both a strong profit engine and an undervalued price. Greenblatt provides a free stock screener using his formula on his website, which comes in handy for quick and dirty assessments like this one. Using that assessment and screening for companies with $50 million or more in market cap, Cisco returns as one of the top 30 undervalued stocks in that entire universe. In fact, no other stock in the top 30 has a market cap over $13 billion (Cisco's market cap is more or less 10 times that large). Based on Greenblatt's formula, this may be an amazing opportunity to buy a major large-cap stock -- a Dow component no less -- for very, very cheap. There is nothing magic about any investing formula. Using these valuation methods is just the first step to understanding a company and perhaps, maybe, only after doing your full research, making an investment. Do you homework, take your time, and use your own judgment. But this is a great place to start!